We went to my sister’s for Father’s Day on Sunday. They all spent a rather hellish week at a children’s hospital with my niece’s one-year-old daughter who became very ill with Type 1 Diabetes that came on suddenly after a virus. We had no idea this could happen, it was very scary and quite a shock. After my son and daughter-in-law lost their unborn baby girl, my family could still count my parent’s great-grandchild blessings when they thought of our healthy, happy little Aryielle. Ha, said the Universe, not so fast! While googling Aryielle’s illness I came across a surprising fact, apparently the same rogue gene region that can trigger gluten intolerance can also cause Type 1 Diabetes. Something my family needs to keep in mind (I have one of the Celiac genes). After we got home another storm blew in and this one brought along some marble-sized hail. Click on the pic above to see a larger version. It was pretty wild. Mr. bookbabie went out and scooped up a bowl of it (I have no idea why) so I took an iStock-like photo of it for him! What is going on with the weather? Is your weather as crazy as our is? This entry was posted in family, my life, photography, photos and tagged Diabetes, family, Gluten, hail, storms, weather by Lilli Day aka bookbabie. Bookmark the permalink. to get a bowl of these nuggets! i only watched it bounce off everything. i want it to snow! You never know! Floods! The bridge over the Mississippi River at my hometown closed at midnight. The water treatment plant is nearly flooding and my 83 yo mom and other family are filling all available containers with water. Ugh! Luckily my home is on a hill so we are high and dry. I have walked for Juvenile Diabeties for 3 years. The son of a good friend of mine was diagnosed when he as 3. I pray they find a cure! Our weather is weird too! I actually have a post on my blog about the hail we got a few weeks ago! CRAZY! I was recently diagnosed with Lupus and have found all sorts of diseases that attack the immune system.. including diabetes and celiac. Much like your niece’s daughter.. mine was triggered by a viral infection as well. Scary! I am thinking good thoughts for that little girl. As for the weather.. I am in California and it is strange for us here too. Hot, which can be expected but overcast and humid?? Not so common for this time of year. I think we are all seeing the effects of global warming. 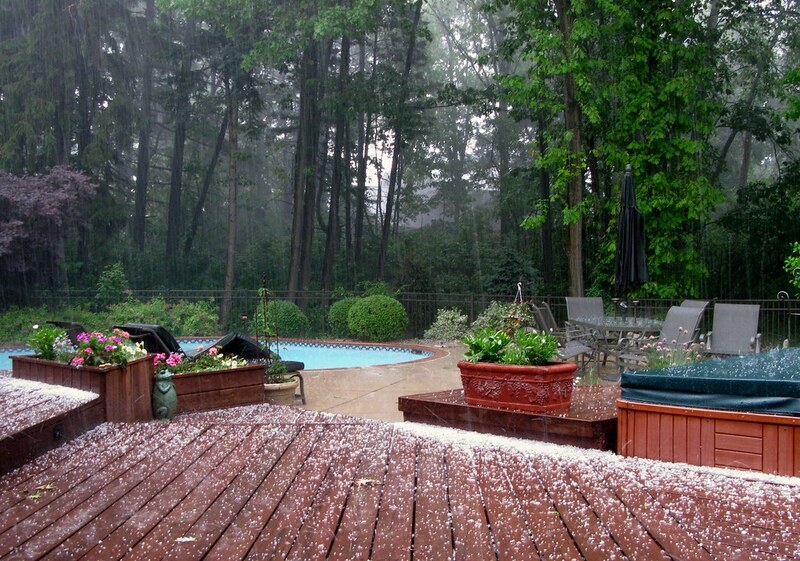 Hail can be pretty, but if the stones are too large it can be a very devastating storm by-product. Nothing like having a vehicle exposed and wondering just how large those little ice balls will get. Glad that was the worst of it for you. We occasionally get some hail down this way, but now too often. Ours is very hot with 108 yesterday and 109 degrees F expected today. 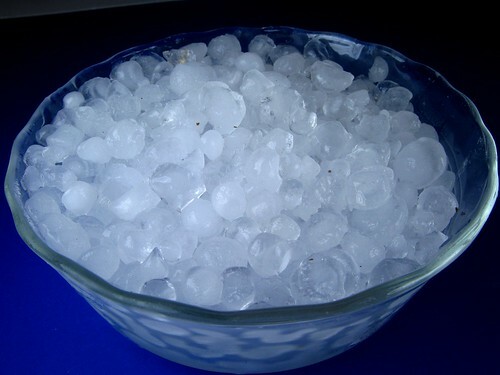 Right now that icy bowl of hail looks refreshing! So sorry about your nice. That was quite a scare! I had a niece aquire the same disease in the same way with the same sudden onslought. she was only 2 or 3 at the time but now she is almost a teenager and doing just fine! I had no idea about the connection to celiac disease though. That’s a new one on me! I pray she and your family are doing well and adjusting to her new life. BTW, I read “Loving Frank” and I loved it! Hot and humid over here…and that’s just the menapause. The weather is crumy too. Ha! On a serious note, my prayers are with you and your family and that precious baby girl. What incredibly huge hail stones! My thoughts are with you’re little Aryielle.